We are looking for an enthusiastic Consultant to work in our dynamic and expanding Ophthalmology team. Full time and part time applications are welcome and the post is available as soon as an ideal candidate or candidates are found. We would welcome applications from individuals with experience in general ophthalmology with a sub specialist interest that will support the delivery of the demands of the service. It would be desirable although not essential that you may have subspecialist interest in Glaucoma, Corneal or Medical Retina however other areas of subspecialist interests will be considered. Candidates for this role must have Full GMC registration with a Licence to Practise and recent experience within the NHS. You will be expected to possess FRCOphth (or equivalent qualification), be eligible for entry onto the GMC Specialist Register via CCT (proposed CCT date must be within 6 months of interview), CESR or European Community Rights. The Trust have recently undergone an £800,000 major redevelopment of the Ophthalmology department which has transformed the department that provides services for over 500,000 patients spread over the large County of Shropshire, encompassing Shropshire and Wales. A further £1.2 million has been approved to create a dedicated cataract theatre suite using Virginia Mason flow methodology. Building work is due to commence in late 2018. 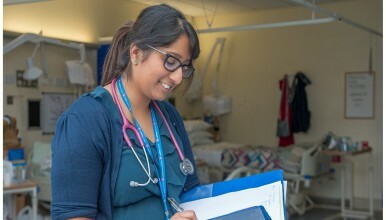 You will be working alongside a friendly, expert and energetic team of Consultants, Staff Grade Doctors, Junior Doctors, Orthoptists, Diabetic Eye Screening, Specialist Nurses and Technicians. The whole department is overseen by the Centre Manager and Clinical Director for Ophthalmology. We are entering an exciting period here at The Shrewsbury and Telford Hospital NHS Trust. We have been guaranteed more than £300 million pounds to develop our hospitals into two state of the art facilities that will offer greatly improved environments, more sustainable staffing and better facilities. It will make SaTH a better place to work, in turn making it a better place to receive care. Over the last two years we have been building the foundations of a better future through our work with Virginia Mason and our own transforming care institute (TCI). We have introduced a leadership academy with more opportunities for development so all our leaders support, coach and perform at the highest levels, celebrate the hard work of our staff and recognise the wonderful improvements that are being made each and every day. This is a vital stepping stone to ensure we are equipped for our better future and realising our vision of providing the safest and kindest care for our patients. Leadership is about supporting teams to be the best they can be. As we move forward together it is vital all our teams understand their important role in delivering this brighter future for everyone.